Meet the Campbells is an ideal introduction to creative writing around spooky stories. It gives pupils an opportunity to focus on the writer's craft and techniques, and employ these within their own story writing. Brainstorm the features of a scary story - the majority of pupils will be familiar with Goosebumps books. Ask the pupils to remember the scarier points in the film. What techniques did the filmmakers use? One common technique is the build up of tension - often to be dispelled quickly with a jolting return to normality ! This happens several times in the film. Watch the film again looking out for these moments. Download our scary story starters pdf and let the pupils choose one to give inspiration for their own scary story. Can the pupils manage a slow build of tension? Build up a bank of 'Bright Ideas' for scary writing - e.g. a list of phrases to describe feeling afraid, descriptions of a spooky setting. 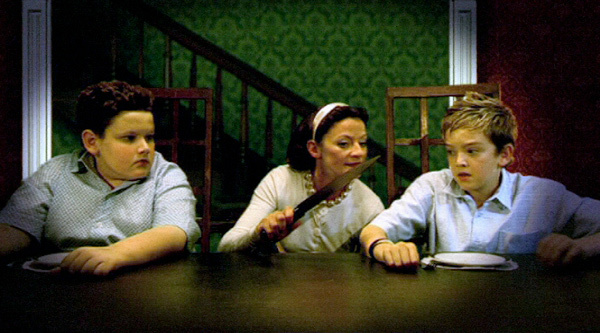 Download and printout our still of the house. In trios get them to brainstorm descriptive words and phrases. Use these to write a paragraph describing the setting which can be incorporated into a scary story. Storyboard a trailer for the film - relate this to other persuasive writing the pupils might have done. How does this compare to the blurb on the back of a book? The plot has to be hinted at but not too much of the storyline given away!